Thomas Darby is my wife’s 1st cousin 2x removed. His parents are David Darby and Charlotte Farmer. Thomas and my wife’s common ancestors are Thomas Darby and Sarah Miles – my wife’s 3x great grandparents. Thomas enlisted at the age of 35 years 11 months on 20 May 1915 in Worcester and his military service number was 30389. His occupation at the time was blacksmith. Thomas listed his next of kin as his daughter Evelyn. His wife Polly (Chance) had died in 1914 at the age of 35. Thomas embarked from Southampton on 3 October 1915 and disembarked the next day. He was posted to his battalion in the 6th Royal Warwickshire Regiment on 6 October 1915. It seems that Thomas managed to remain unscathed until the following summer. He was then injured in action on 19 July 1916 when he received gun shot wounds to his head and arm. He was admitted to the field hospital for treatment. The next day he was injured again with gun shot wounds to his shoulder and thigh. Three days later on 23 July 1916 Thomas was discharged to the Base Depot. After a couple of weeks it appears he was well enough to be attached to the 14th Battalion of the Royal Warwickshire Regiment and was back in action on 7 August 1916. Over the next two years Thomas spent his time either on leave or in the battle field and does not seem to have suffered any further physical injuries. He was demobilised on 6 February 1919. Thomas was transferred to the Class Z Reserve on 7 Mar 1919. Class Z Reserve was authorised by an Army Order of 3 December 1918. There were fears that Germany would not accept the terms of any peace treaty, and therefore the British Government decided it would be wise to be able to quickly recall trained men in the eventuality of the resumption of hostilities. Soldiers who were being demobilised, particularly those who had agreed to serve “for the duration”, were at first posted to Class Z. They returned to civilian life but with an obligation to return if called upon. The Z Reserve was abolished on 31 March 1920. Samuel Buckley is my 1st cousin 2x removed. His parents are Prince Buckley and Ada Smith. Our common ancestors are James Buckley and Sarah Tattersall, my 2x great grandparents. Samuel was born on 28 September 1886 in Keighley, West Yorkshire. He attended a medical in Halifax, West Yorkshire on 5 July 1916 and enlisted on 9 July 1916. His military service number was 346859. I can see from his military records on Ancestry that he was “at home: until 1 May 1918 and then he was on board ship from 2 May to 10 May. Samuel was abroad with the British Expeditionary Force from 11 May 1918 to 24 July 1918. He returned to the UK on 25 July 1918 and spent the rest of his military career at various locations around the country as a fitter. His military service wasn’t without incident however and there are two misconduct charges in his records. The first one took place in Edinburgh on 18 January 1917 when he failed to salute an officer in Princes Street. He was confined to barracks for 5 days. The second incident happened in June 1917 when he was late returning to barracks from a period of leave – he was late by 22 hours 10 minutes and lost 1 days pay. Samuel was demobilized on 25 February 1919 and transferred to the Class Z Reserve. Class Z Reserve was authorised by an Army Order of 3 December 1918. There were fears that Germany would not accept the terms of any peace treaty, and therefore the British Government decided it would be wise to be able to quickly recall trained men in the eventuality of the resumption of hostilities. Soldiers who were being demobilised, particularly those who had agreed to serve “for the duration”, were at first posted to Class Z. They returned to civilian life but with an obligation to return if called upon. The Class Z Reserve was abolished on 31 March 1920. Jim Hurtley is my great uncle – he is my grandmother’s brother. He was born about January 1887 to parents James Hurtley and Ellen Paley. In the 1901 census his occupation is given as ‘bobbin turner’ and in 1911 he is described as ‘manager at hay and straw merchant’. At the time he was living in the village of Cononley near Skipton in Yorkshire. 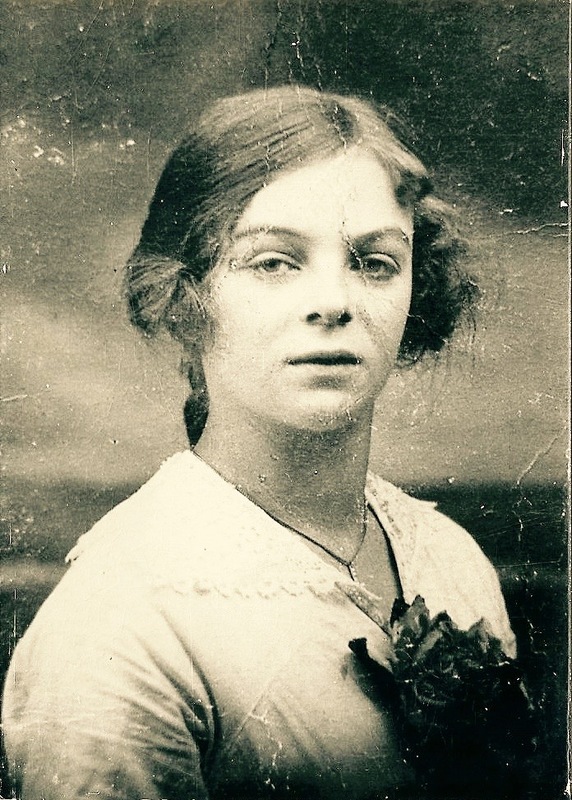 Jim married Jessie Leeming on 28 March 1910 and their daughter Alice was born on 20 September the same year. When the war came he enlisted in the army at Keighley, West Yorkshire on 9 December 1915 at the age of 28 years 11 months. His occupation at the time is given as ‘warehouseman’. His service number is 185500. I’m not sure what happened over the next ten months because the next piece of information shows that he had a medical examination in Halifax, West Yorkshire on 14 October 1916 and was appointed to the Royal Regiment of Artillery on 18 October 1916. Details of Jim’s area of action are not recorded in any great detail. I do know that he embarked from Southampton on 17 May 1917. He then embarked from another port (record unclear) on 27 June 1917 and landed in Alexandria, Egypt on 6 July 1917. Jim was wounded in action on 9 March 1918 but he ‘remained at duty’. There is no more information about his service until he embarked from Port Said on 30 January 1919 to return to England. He was discharged from the army and issued with a ‘protection certificate’ and certificate of identity on 10 February 1919. However, like many of his comrades Jim was retained in the Class Z Reserve. In 1921 Jiim received his British War and Victory Medals. Jim and Jessie had two further children – Jim (born about September 1920) and Phyllis (born about September 1924). Jim died at the age of 60 in 1947. Herbert Mark Carradice is my 1st cousin 3x removed – our common ancestors are my 3x great grandparents John Carradice and Ann Ridley. Herbert was born in Kendal, Westmorland, to parents Alexander Carradice and Adela Ormandy Birkhead. His birth is registered in the December quarter of 1895. I have been lucky enough to find his WW1 service records on www.ancestry.co.uk so I know that Herbert enlisted on 3 October 1916 at Carlisle, Cumberland. His regimental service number is 242249 (or 4360) and he was assigned to the 4th Border Regiment. His age is given as 20 years 10 months and his occupation is ‘tailor’. 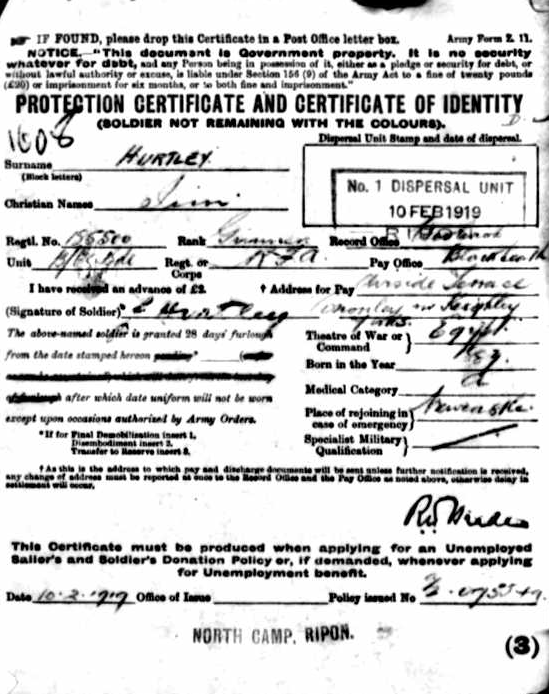 Herbert’s ‘military history sheet’ shows that he was at home from 3 October 1916 to 14 January 1917. He embarked for Boulogne on 15 January 1917. The next piece of information shows that Herbert was wounded in action on 3 July 1917 and was moved to Etaples Military Hospital. He presumably recovered well enough from his injuries and rejoined his battalion on 2 September 1917. As Christmas approached Herbert was granted leave from 24 December 1917 to 7 January 1918. MISSING is stamped on his record on 10 April 1918. 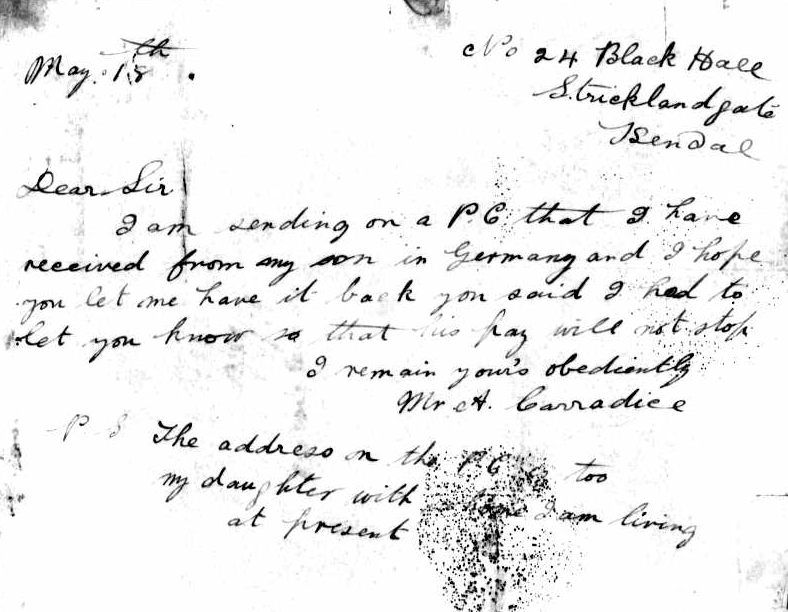 Underneath that is a note dated 6 November 1918 that Herbert is a ‘prisoner of war’ but the location is unclear’. Another document in his records shows that Herbert was captured on 21 March 1918 and interred in the town of Roisel. 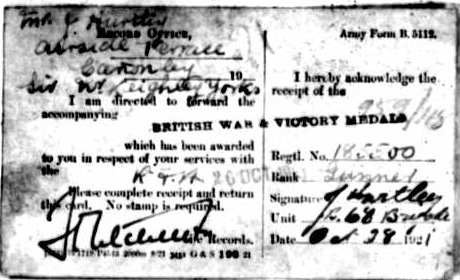 On 10 December 1918 Herbert’s service record shows that he arrived back in England as a ‘repatriated prisoner of war’. During Herbert’s time as a ‘prisoner of war’ his father, Alexander, was clearly anxious about his son. 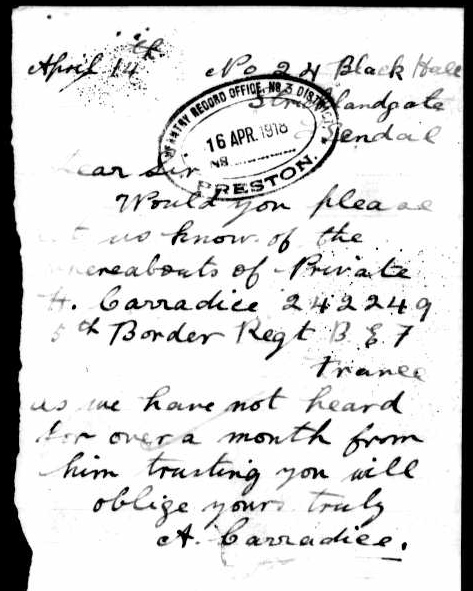 On 14 April 1918, having not heard from Herbert for over a month Alexander wrote to the army asking for information. On 18 May 1918 Alexander wrote again to the army sending on to them a postcard he had received from Herbert in Germany. It seems that the army had asked Alexander to let them know if he had any contact from Herbert ‘so that his pay will not stop’. Akexander asked for the postcard to be returned to him – I wonder if t ever was. 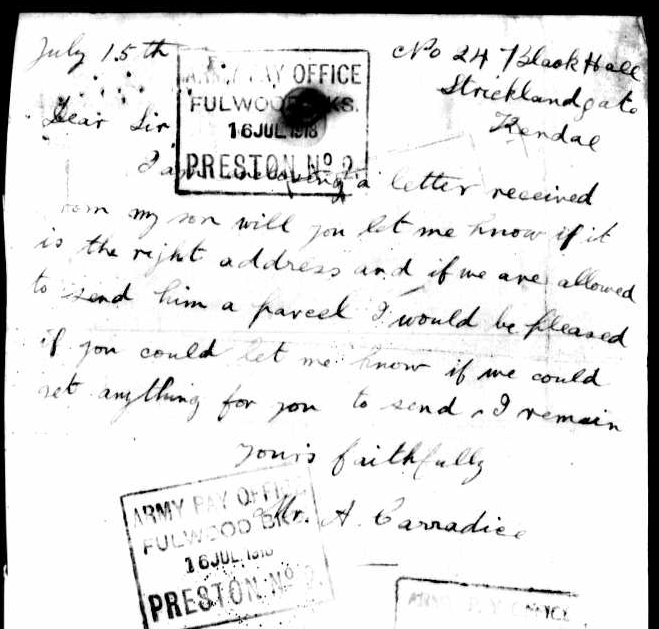 Alexander subsequently had a letter from Herbert and wrote to the Army Pay Office on 15 July 1918 asking if he was allowed to send a parcel to Herbert. Herbert was finally ‘demobbed’ on 26 Novemeber 1919. However, like many of his comrades he was retained in the Class Z Reserve. Herbert married Hilda Marshall in Kendal, Westmorland sometime in the September quarter of 1927. They had two children – Audrey in 1928 and Edwin in 1929. Herbert died in 1935 – he was only 39.